Fromage d'Affinois is a wonderfully luscious, pasteurized cow's milk, soft-ripened French cheese that is in the double-crème category. Mild and buttery, it's an amazing addition to the Brie world. It's produced from milk that has been specially filtered to break down some of the fat content; yielding a lighter, smoother, silkier texture than other Brie. The filtering makes the Fromage d’Affinois lighter than other Brie in terms of weight, but is certainly creamier and a little thicker than most. 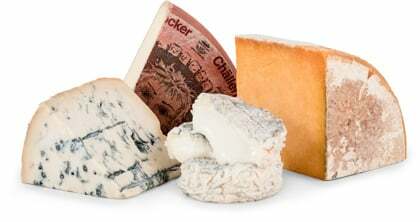 The cheese is made using a process known as ultra filtration. The process is somewhat similar to homogenization, and serves to remove water from the milk. This concentrates and distributes all the other components in the milk, including fat, evenly throughout the paste. Ultra filtration imparts a taste as rich as most triple-cremes, although the fat content is closer to a double-creme. 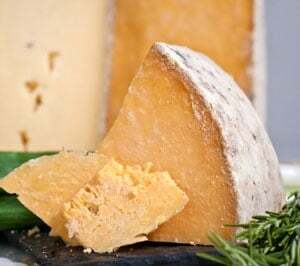 In addition to retaining more fat, ultrafiltration allows the cheese to retain more protein and nutrients, and actually accelerates the cheese making process. Whereas Brie takes eight weeks to make, Fromage d'Affinois takes just two. When ripe the cheese has a runny texture that coats like icing. The rind is flawless and adds flavor to the sweetness of the cheese. Fromage d'Affinois' sweet and mild flavor is lighter than the mushroom-like earthiness characteristic of its identical-looking cousin. It also has a freshness that distinguishes it from Brie. It's a must for cheese trays: absolutely sinful—and even more sinful served with a fig spread. Pair it with crusty artisan bread or with fruit. If you have it with bread, enjoy it with a red zinfandel or Beaujolais. If you serve it with fruit, a sauvignon blanc, viognier or chardonnay – light on the oak – will complement it well. For that matter, it pairs well with almost any white wine, dry or sparkling.